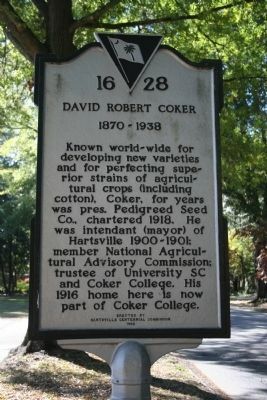 Known world-wide for developing new varieties and for perfecting superior strains of agricultural crops (including cotton), Coker, for years was pres. Pedigreed Seed Co., chartered 1918. He was intendant (mayor) of Hartsville 1900-1901; member National Agricultural Advisory Commission; trustee of University SC and Coker College. His 1916 home here is now part of Coker College. Location. 34° 22.65′ N, 80° 4.268′ W. Marker is in Hartsville, South Carolina, in Darlington County. Marker is on E. Home Ave., on the right when traveling east. Touch for map. Between 3rd & 4th Streets. Marker is in this post office area: Hartsville SC 29550, United States of America. Touch for directions. Other nearby markers. At least 8 other markers are within walking distance of this marker. James Lide Coker (within shouting distance of this marker); Welsh Neck High School / Coker College (about 600 feet away, measured in a direct line); John L. Hart / John Hart House (#1) (approx. 0.2 miles away); First Baptist Church (approx. 0.2 miles away); Carolina Fiber Co. / Sonoco Products Company (approx. ¼ mile away); Eastern Carolina Silver Company (approx. ¼ mile away); Hartsville Veterans Monument (approx. 0.3 miles away); Hartsville Oil Mill (approx. 0.3 miles away). Touch for a list and map of all markers in Hartsville. More. Search the internet for David Robert Coker 1870-1938. Credits. This page was last revised on June 16, 2016. This page originally submitted on November 17, 2010, by David Bullard of Seneca, South Carolina. This page has been viewed 431 times since then and 7 times this year. Photo 1. submitted on November 17, 2010, by David Bullard of Seneca, South Carolina. • Bill Pfingsten was the editor who published this page.